How do you define Spring? Green shoots abound in my garden, tiny specks of promise amidst the bleakness of winter. They provide acid green accents between the muted colours that surround them. 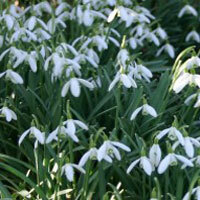 Snowdrops provide a splash of purity of white, their tiny blooms bobbing on the February breeze. An early primrose brings the colour of the spring sunshine to come. All these signs provide an enticing glimpse of what lies around the corner in the next few weeks. The hellebores have the light green of their new growth – the first plant to show its face at the onset of spring. It’s the start of the creative cycle of the garden: a timeless journey, that repeats with a comforting regularity. Although nature still looks and feels like winter in the shade, or on days that the rain lashes down, we have long since left the solstice behind, and so are past the darkest point of yin. Yang is now starting to rise, the movement out of the quietness of yin. Consequently, it’s a time to stretch, to waken up, to prepare for Spring.